The New York Yankees were stoked to show off their new concession offerings to the media at a pre-Opening Day event Monday: a Filipino adobo chicken bun, Yankee Stadium Grand Slam Shakes (served in souvenir cups)—and the most Instagram-worthy new item, images of Yankees’ players faces in beer foam. But Major League Baseball came along to rain on their parade, Newsday reports, sending the organization a cease and desist for printing the likeness of Aaron Judge, Giancarlo Stanton, and others in beer foam. The portraits were created by a new machine called Beer Ripples, capable of “printing” art onto beer foam and other beverages. According to Newsday, the league doesn’t have rules against players marketing alcohol, but the team and player would presumably need the express written consent of Major League Baseball. 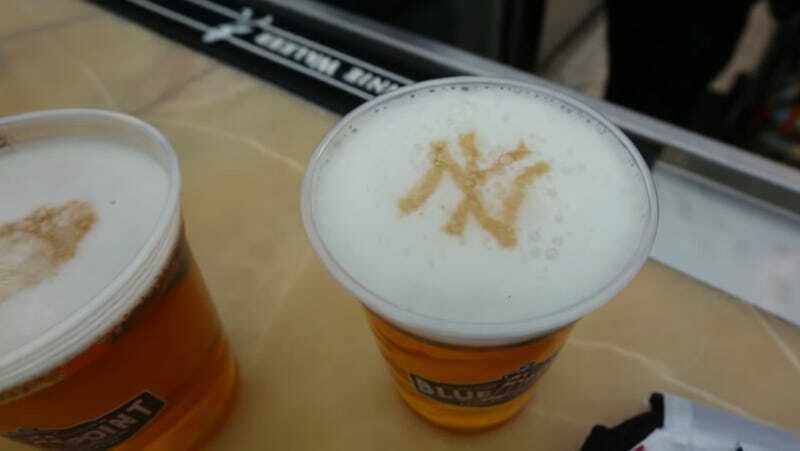 The Yankees organization says it has no plans to continue the beer-foam portraits, which is a bummer, because it probably puts the kibosh on other team’s beer art as well. I would have loved to see the Colorado Rockies’ attempts to capture Charlie Blackmon’s hirsute visage in Coors Light, or the artistry involved in making Texas Ranger Tim Linecum look above the age of 16 in his foam rendering. I also had plans to gaze dreamily into a cup topped with Kris Bryant’s likeness. Maybe there’s still hope of searing players’ likenesses onto burger buns, or creating nacho cheese portraits? This early in the season, hope springs eternal.